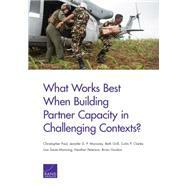 What Works Best When Building Partner Capacity in Challenging Contexts? Strategic imperatives sometimes compel the United States to work with partner nations that lack the characteristics that favor success in building partner capacity. This report explores what the United States can do in such contexts to maximize prospects for success by specifically looking at potential challenges and workarounds and deriving recommendations for future engagements.